Protect your money and your identity. These sleeves make it easy to protect yourself in the modern world. Fits in any wallet over any card. One order will ship as a pack of 10 total sleeves. RFID can be found embedded in some credit cards, passports, and even some driver’s licenses. When this technology was placed inside of important handheld items like credit cards, it was designed to make a person’s life easier. For instance, RFID technology was meant to make smaller, everyday purchases such as toll payments easier by sending radio signals to the RFID sensor chips on things like credit cards in order to permit faster identification and authorization without contact. Advances in technology can introduce some negative consequences. The negative side of RFID technology is its lack of protection. There is no way to stop or cease the radio wave signals that are transmitted between a reader and a person’s credit card or passport. Therefore, information that is stored on an RFID embedded item can be easily stolen from several feet away if an RFID reader is put into the wrong hands. The act of wireless identity theft and credit card theft using an RFID reader is called RFID skimming. The fact that this form of theft is so simple and easy to execute causes many people to live in fear. How do I stop it? Do I need an Anti-Theft sleeve? 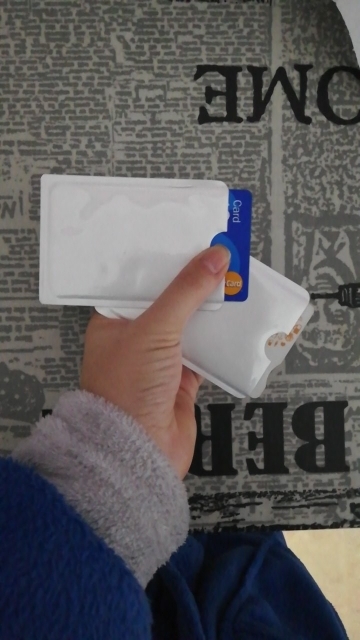 Getting an RFID blocking sleeve might be a good idea for those who are issued a credit card with embedded RFID technology. RFID blocking technology turned the tables, as it gave people a way to interrupt radio wave signals between a reader and the RFID embedded items. RFID blocking wallets create an electromagnetic-repelling shield that surrounds the items inside the wallet. This shield effectively stops reader users from committing identity theft and credit card crimes. Although RFID blocking technology has been around for a while, RFID blocking wallets continue to be a popular item among online shoppers. In 2016, 15.4 million people were victims of identity theft, and the numbers continue to rise. The advancement of online technology has introduced constant data threats worldwide. Victims of identity theft often experience a loss of money, negative impacts on their credit scores, account consequences, etc.